Created by Abraham “Bram” Stoker in 1897, Dracula has appeared in everything from movies, television and even video games. The original novel has itself been adapted several times. What about Vlad the Impaler? Now I know what you’re probably thinking, what about Vlad Țepeș (TEH-PESH)? Contrary to popular belief, this Romanian prince was not the direct inspiration for Dracula. According to his working notes, Stoker had the basic outline of the story already laid out before tying in the stories of Vlad the Impaler, leading many scholars to believe that it was more of an afterthought. Many scholars also suggest that Stoker drew inspiration from various folk legends and historical figures like Erzsébet Báthory, who tortured and killed over 650 young girls in order to bathe in their blood, believing it would preserve her youth. This week, we’re taking a look at two notable adaptations of Bram Stoker’s novel. The first is the 1931 version of Dracula directed by Tod Browning and starring Bela Lugosi. The second is the 1992 version, directed by Francis Ford Coppola and starring Gary Oldman in the role of Dracula. Both versions have been praised by fans and critics alike. [1931 version] The Gothic sets are extremely well designed. Although simple by today’s standards, they capture the Gothic atmosphere that Bram Stoker most likely envisioned. The cinematography of this film is what makes some of the moments of this film classic. By showing the grandiose and derelict nature of Castle Dracula it makes the halls and undercrofts look even emptier, setting an eerie tone. [1992 version] The settings in this film are on the same level as the 1931 version, but Coppola doesn’t hesitate to use many colorful elements. He uses color to differentiate the settings—a grim black for Transylvania, shades of gray for London and more extravagant colors to express the characters’ personalities. Everything in this film is shot in a style that is reminiscent of all of the classic horror films. But Coppola also puts his own style into the film with some of the more artistic shots, achieving its own unique sense of eeriness. Winner: The 1992 version. The atmosphere of this film is a little more complete and is a little bit easier to be drawn into. [1931 version] Things are kept simple and treated like a stage play. The pacing of the story does feel a bit rushed at times, with some unexplainable transitions put in to keep things moving. The cast of characters is greatly reduced in this version from the original novel. As a result, the dynamic is different and several events are omitted. To me, it feels a bit like the Cliff Notes version of Dracula. [1992 version] This version is a little more complex than the 1931 version and has more events happen overall. The pacing of this is steadier, nothing feels rushed nor does the film drag. This seems like a more detailed version of the story that adds subtle nuances here and there to make a more realistic world. All of the characters from the novel are present and are given a great deal of development, having better defined traits and personalities, resulting in the viewer being more invested. Winner: The 1992 version, as it tells a more engaging and complete story that’s easier to become absorbed in. 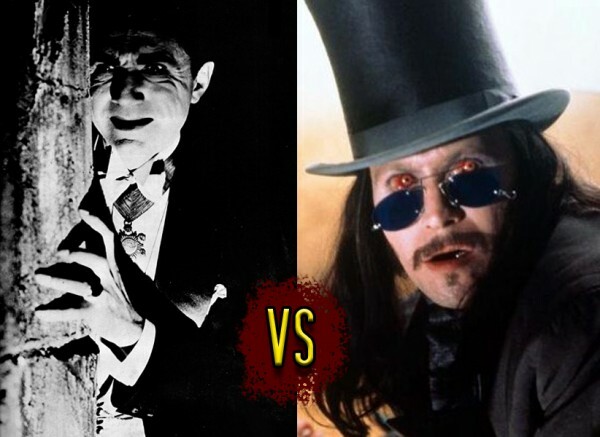 Bonus Round: Who’s the better Dracula? [1931 version] Bela Lugosi’s performance set the standard for how Dracula is portrayed in many other forms of media. Lugosi has a look that was both alluring and terrifying, and comes across as someone who could be a friend, but could also stab you in the back at a moment’s notice, almost like a character from an Oscar Wilde story. [1992 version] The way Gary Oldman portrayed Dracula captured both the terrifying elements as well as more of the romantic elements that were brought to the character, which is where he is at his strongest. It may not be on the same level as Lugosi, but Oldman gives a performance that creates another original form of Dracula that has also translated to other media, as well as indirectly serve as inspiration for some “other” vampire lore. Winner: For Dracula, it’s a tie because it’s two entirely different schools of thought at work here. Do we want a simple two-dimensional villain, or a villain with a sympathetic back story? Do we want the repulsive fiend from the novel, or the tortured soul with a violent temper? [1931 version] This version has minor deviations throughout. The characters of Quincy Morris and Arthur Holmwood are omitted and Harker is replaced by Renfield in the opening scenes. The climax itself is also different, with only Van Helsing killing Dracula in the undercroft of Carfax Abbey instead of the full party of Harker, Van Helsing, Quincy, Holmwood, Seward, and Mina slaying him back in Transylvania. The other deviations are mainly character based while the premise of the story is kept intact. [1992 version] As my good friend Smitty put it, “It’s the truest to the novel, but it makes the biggest departure.” It stays incredibly true to the novel, but its large departure is the romance between Mina and Dracula. Part of a subplot is about Dracula’s lover from when he was alive. Elisabetha, he believes has reincarnated into Mina. This was probably added to make Dracula a little more sympathetic, but people tend to be divided about this, especially in recent years with “certain” iterations of vampire lore. Winner: It’s almost no contest. Despite the huge departure, the 1992 version is still more faithful to the source material. The 1931 version is a classic, but the 1992 version is the more complete film. If you are in the mood for a poetic form of Gothic horror, and are also a fan of the original novel, then this is the version for you. I still highly recommend the 1931 version of Dracula since it’s a classic and gives you a great insight into the evolution of the vampire in fiction. Next week, given that the next paper will be released on Halloween, we’ll be taking a look at the old and new versions of “Halloween”. Just hope you don’t have to do any babysitting that day.